Cinderella stories are part of what makes March Madness so special. But not all Cinderellas are created equal; it's a broad phrase. They generally fall into certain buckets. Let's try to pinpoint some of the different types of March Madness Cinderellas below. You'd probably never heard of these guys when their names popped up on Selection Sunday, and frankly, picking them to advance just would have been reckless in the moment. They usually don't advance as far as some of the others we'll get to. 2018 UMBC, for instance, only won one game. But it was the first 16 seed to ever upset a 1; we know way more about the 2018 UMBC Retrievers than the average college basketball team. They qualify as a Cinderella. Florida Gulf Coast is another recent 'came out of nowhere' Cinderella. The Eagles were the first 15 seed to ever reach the Sweet 16. Side note: Every school listed above was a 13 seed or lower. All won more than one game besides UMBC. The classic version of a Cinderella. These are the teams that those "in the know" are talking about on the Selection Sunday show. They are sleeper candidates. But that certainly doesn't take away from what they've accomplished, because multiple teams fit the so-called "sleeper" bill each year — and they usually lose in the first round. Most of these schools fall in the 10-12 seed range and pile up a ton of regular season wins, but haven't faced the level of competition that top seeds do. Loyola Chicago is the most recent example. The Ramblers were a popular first round upset pick in 2018 and went 28-5 in the regular season. Obviously, it was a huge surprise to see them reach the Final Four. But people knew they were good coming into the NCAA tournament. That's the general formula for this tier of Cinderella. These are the teams who are probably maddening to root for if you have an allegiance to them in the regular season. They'll win games they aren't supposed to win, and lose games they aren't supposed to lose. Talented, but inconsistent. They safely make the NCAA tournament come Selection Sunday, but there's no real reason to think they'll go far. And then you look up three weeks later, and they're in the Final Four. Syracuse and South Carolina are the two most recent examples, but they bowed out in the national semifinals. 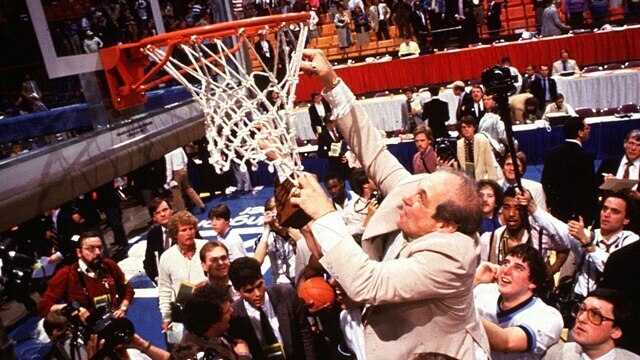 1985 Villanova defeated Georgetown in the national championship game, and as an 8 seed, was the lowest-ranked team to ever win it all. N.C. State won it all two years prior as a 6, defeating Clyde Drexler, Hakeem Olajuwon and Phi Slama Jama. These schools are the reason March Madness brackets are so tricky to fill out. If you watch them closely all season, you may come away unimpressed. But they are talented bunches that catch fire at the perfect time. Not quite as common as the other three, but when you see it, it's mesmerizing. Kansas could probably qualify for the above tier, too, but Danny Manning was so sensational in the 1988 tournament that he should be highlighted. He averaged 27.2 points per game, including a 31-point, 18-rebound performance against Oklahoma in the title game. Bryce Drew was Valpo's leading scorer by a healthy margin and also made one of the most famous shots in college basketball history. In Davidson's three tournament wins, Curry averaged almost 35 points per game and made 52.8 percent of his 3s. And Shabazz Napier carried No. 7 seed UConn to the national championship in 2014, scoring at least 22 points in four of the Huskies' six NCAA tournament wins. These guys put their teams on their backs.